In a warm summer evening after attending the Oriental Dance Festival the three of us sat, drunk wine and discussed dancing and the expression of the national mentality in it. Here are some purely subjective observations. Oriental belly dancing - womanhood, eroticism, and also some feminine cunning, which leaves no joy, no sadness, alone like a star, as a value, as an object of admiration. Gypsy dance - revelry, pride of belonging to Gypsy camp, but no dignity, no individualism, a dance for the public, for the crowd. Latvian dance - obedience to some regulations, steps taught in generations, no improvisation, subordination of the perception of ethical and aesthetic criteria, usually only partner dancing, ritual, symbolism, ornament. Russian dance - showing off, can be performed alone or in groups, no mysteriousness, no brain, no erotics, only open emotions, sexuality, bravery. Spanish dance - self-confidence above everything else, moving forward both in happiness and deep sorrow with a head held high. Flamenco - a mixture of traditional Spanish dance and music that can be found in more than 50 different stylistic derivatives. Flamenco is usually performed accompanied by a guitar and percussion, the rhythm is emphasised also by clapping of hands or palms and castanets. 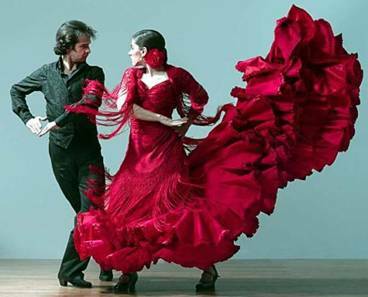 Flamenco dance performers are called bailaor, singer - cantaor, but guitarist - tacaor. The germ of Flamenco can be found in Moorish musical culture, also it has been highly influenced by the Spanish Gypsy culture. In the 15th century Gypsy colonies settled in Andalusia who were fleeing from the collapsing Byzantine Empire. Their dancing was influenced by the national traditions of Moorish, Jewish and Spanish people. Thus a new style of music emerged and spread around Spain - flamenco that has been maintained and regarded as a national treasure by Spaniards. Even though initially people in Spain tried to distance themselves from flamenco as introduced by Gypsies, in the 18th century it was widely performed on the small stages of taverns and cantantes. At the end of the 20th century flamenco included also Cuban melodies and jazz motives but in the dance elements from classical ballet appeared. Flamenco music and dance contain many improvisational elements, so each performance is unique and it is hard to take down flamenco score or choreography-wise. Usually the art of performing flamenco is handed down to a trainee through training and observing. An important attribute of a flamenco dancer is the traditional dress - Bata de cola. Usually full-length, dotted, decorated with many frills and folds. Looking at a dancer dressed like this instinctively the association appears with a traditional Gypsy costume. An integral part of the dance is a play with the skirt of the dress. Spanish shawl or scarf with long fringes is an integral part of a flamenco dancer`s outfit. Of course, mysteriousness and emotionality are added by a big Spanish fan. A traditional dancer's costume consists of black pants, wide belt and a white shirt with wide sleeves. Sometimes the edges of the shirt are tied in front, as well as a short bolero - chaleco. It is believed that castanets are an integral part of flamenco. But usually the rhythm of the dance is maintained by clapping one`s hands - palmas, snapping one`s fingers - pitos or snapping one`s heels together - sapateado. Flamenco styles - palos - differ from each other with the rhythm. The most popular styles are Toña, Soleá, Fandango y Seguiriya. They belong to the oldest ones - cante jondo - and somewhere in tune are similar to ancient Indian dance traditions. The second category - cante flamenco – combines dancing, singing and the sounds of a guitar.